296 pages | 170 B/W Illus. The current automotive industry faces numerous challenges, including increased global competition, more stringent environmental and safety requirements, the need for higher performance vehicles, and reducing costs. The materials used in automotive engineering play key roles in overcoming these issues. 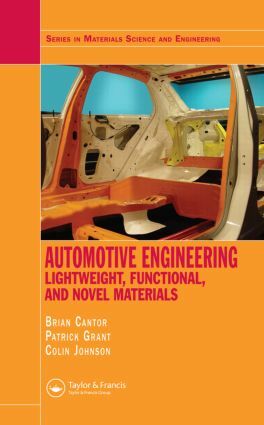 Automotive Engineering: Lightweight, Functional, and Novel Materials focuses on both existing materials and future developments in automotive science and technology. Divided into four sections, the book first describes the development of future vehicles, aluminum alloys for manufacturing lighter body panels, and various polymer composites for stronger module carriers. It then reviews state-of-the-art functional materials and smart technologies and projects in which application areas they will most impact future automotive designs and manufacturing. The next section considers the difficulties that must be overcome for light alloys to displace ferrous-based materials and the increasing competition from lightweight polymeric-based composites. The final section explores newer processing and manufacturing technologies, including welding and joining, titanium alloys, and durable, high-performance composites. With contributions from internationally recognized experts, this volume provides a comprehensive overview of cutting-edge automotive materials and technologies. It will help you understand the key materials and engineering concerns currently confronting this industry.